A reader, reviewer, proofreader, and editor; my goal is to share my love of books with others, so this is where I will be posting my reviews! Set roughly a year and a half after Terrier, Beka Cooper's adventures continue in Bloodhound: The Legend of Beka Cooper #2. Beka is now a full Dog but she has problems keeping her partners -- unfortunately, no one can quite meet the standards that Beka keeps to in patrolling the Lower City and keeping the law. After arresting one partner and having another one drop her because she was too enthusiastic (while he was too lazy) Beka finds herself partnered with Tunstall and Goodwin once again. Life in the Lower City is never routine, but things become rougher than normal when coles (counterfeit silver coins with a brass center) are found and the bread prices rise. After a riot leaves Tunstall with two broken legs, Cooper and Goodwin are sent to Port Caynn to hunt down the source of the coles... hopefully before people starve in the hard winter to come. While I didn't enjoy Bloodhound as much as I loved Terrier, it is a great book written in Tamora Pierce's Tortall universe. I would have loved to have seen more of Rosto, Kora, and the other Corus Rogues, but it was interesting to see how Dogs and Rogues worked together in another city. Beka really comes into her own in this tale: Still impatient and spontaneous, she must rely on her own wits -- with the company of Slapper and Achoo -- while trying to keep one step ahead of both the local dogs and the Court of the Rogue. Full of danger, romance, corruption, and mystery, this is another must read book for anyone who loves Pierce's writing and the stories she creates. 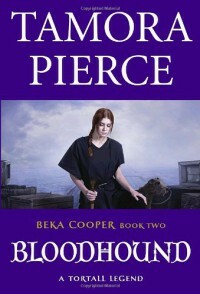 If Bloodhound: The Legend of Beka Cooper #2 sounds like a novel that you'd enjoy, the kindle edition can be found at http://www.amazon.com/dp/B000UZNR6E/?tag=shasworofboo-20. If you enjoyed my review, please help me share it by marking it as being helpful on Amazon. I have included the link to the Amazon review in the Source section at the bottom of this review. Imager's Battalion: The Sixth Book of the Imager Portfolio by Modesitt, L. E.(October 29, 2013) Mass Market Paperback by L.E. Modesitt Jr.